Telawi’s new kid on the block is a promising one. 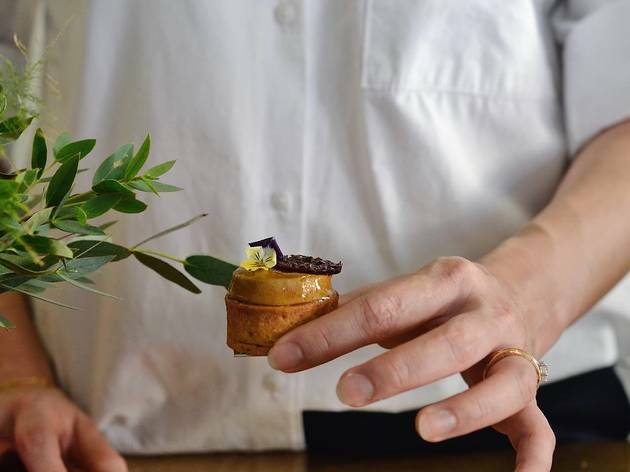 Opened by Jaslyn Rangson right next to her namesake bakery/café, this new patisserie/florist marks how far Bangsar’s favourite baker has come since Jaslyn Cakes opened in 2014. 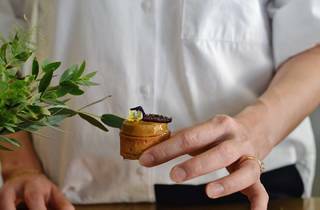 While the neighbouring cake shop exudes a homely vibe with a counter packed with honest-to-goodness cakes and pastries, Dew is shiny, elegant and pretty in more ways than one. 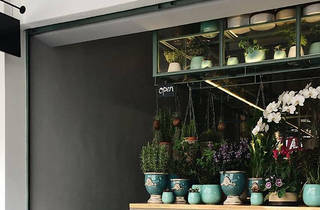 The charm starts at the entrance, which is dotted with vases in shades of robin egg blue housing pretty flowers and verdant plants for sale by O Flwr, a well-known florist among KL’s socialites. Stop and smell the roses, and maybe bring back a box of flowers for a loved one. Once you’re done admiring the crimson petals, step into the patisserie and you’ll see a glass-topped counter filled with rows of enticing, shiny tarts. Two distinctive speckle-tiled tables in the small space comfortably seat a group of three each, while an emerald-hued table in the corner (a popular spot that gets nabbed fast) accommodates slightly more. 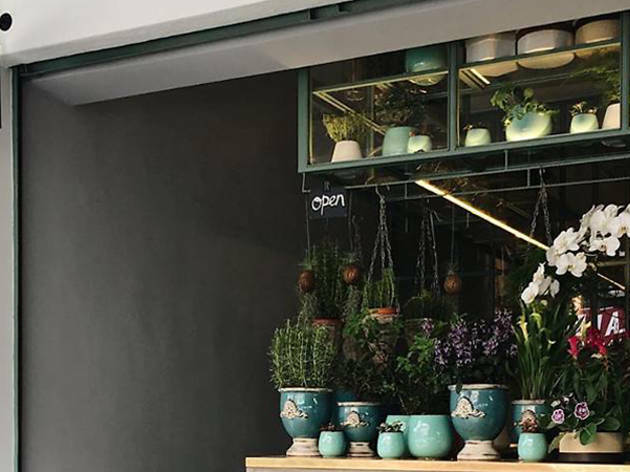 There’s no need to be crestfallen if you can’t spot empty tables inside – Dew’s florist section at the entrance also doubles as outdoor seating. Pretty tarts amidst pretty florals, what’s not to like? Tart-wise, it’s hard not to go for the whole lot and have a happy tart party, but we say go for the Basil-Lime Tart and 100% Chocolate Cake. 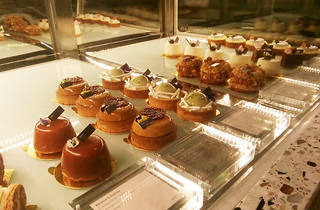 Each pastry is lovely and is delicately plated with an obvious sense of craft by Jaslyn and co. 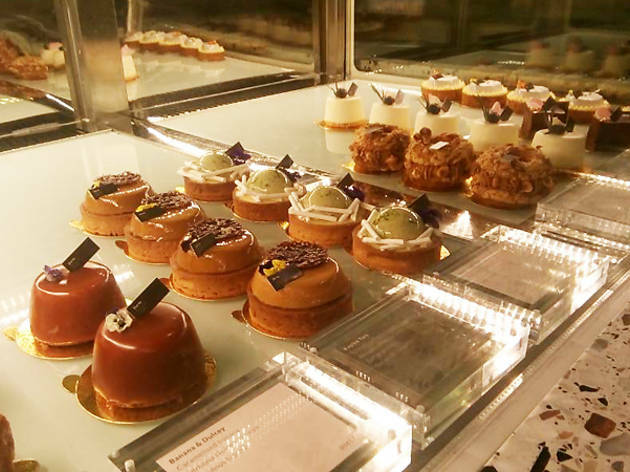 Priced in the RM17-24 range, the desserts here don’t come cheap, but that’s only because there’s so much more finesse and quality ingredients used in making them. 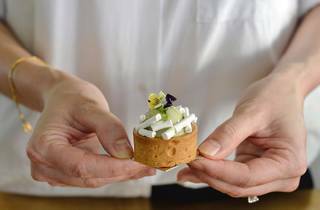 The Basil-Lime with basil mousse atop basil and lime curd with tiny meringue sticks artfully placed around the tart is a burst of fresh flavours, thanks to the fragrant basil and delightfully sour lime. 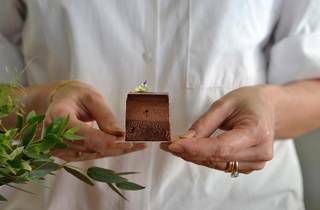 Alternate forkfuls of the tangy dessert with the decadent 100% Chocolate Cake, a multi-layered affair of wide-ranging textures that span from creamy and spongy to light and smooth. 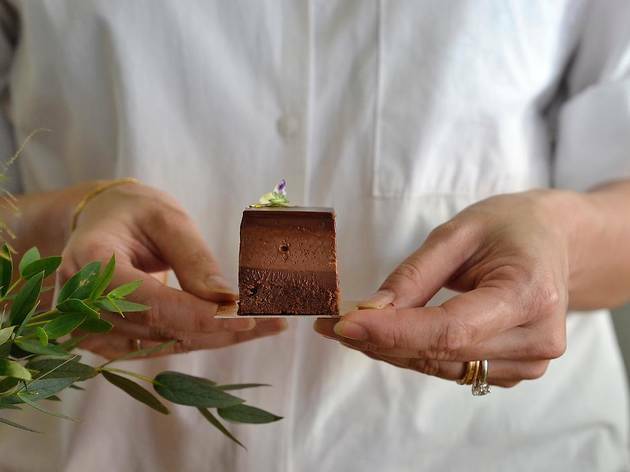 That’s all from the flourless chocolate cake, Valrhona Caraibe chocolate ganache and single-origin Madagascar 67.4 percent chocolate mousse; it’s a chocolatey mouthful that’s sure to cut through the lime. Another popular choice is the Kopiko tart, which is inspired by its namesake hard candy and made from Nescafé coffee mousse paired with ganache, coffee praline and topped with a cocoa nib nougatine. The flavours are quite intense, so it’s best shared between two. 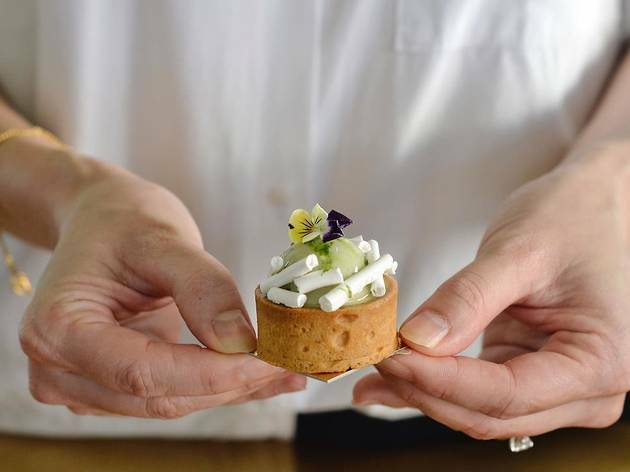 There're more to try – such as the promising Banana & Dulcey with caramelised banana, Valrhona Dulcey mousse and speculoos biscuit – but it's hard to get through the eight varieties of tarts Jaslyn makes each day in a single afternoon. These call for future visits, and they’re ones we’re looking forward to.